Who here just wants to cross a damn stream in a new, American-market Alfa Romeo without having the car fill with water and drown? Everyone, that’s who, and now that’s possible, thanks to Alfa’s new Stelvio SUV that just dropped tonight. Now, in addition to the tiny, mid-engined sportscar 4C and the lovely Giulia sedan, Alfa will have an SUV, though, considering the role the car will play for Alfa Romeo, three more apt letters are likely ATM. SUVs are still the current sales champions in the US market, and if Alfa wants to keep charming us with beautiful little mid-engined sportscars like the 4C, lots and lots more people need to buy Stelvios. This is not uncommon at all for a small specialty marque like Alfa; look at Porsche, and you’ll see that the Macan and Cayenne are basically the Porsches with jobs. The new Alfa SUV is named after that amazing Italian road shown in that Top Gear episode, and it’s based on an all-wheel-drive variant of the same Giorgio platform that the Giulia is based on. According to Motor Authority, the Stelvio (that always sounds like that sweetener, Stevia, to me, which always sounds like Salvia, that not-really-a-drug thing) will have a Quadrifoglio version from the start, and will use the Giulia’s twin-turbo 2.9-liter V6 making 505 HP/443 lb-ft (316 Nrp)of torque. There’s an 8-speed auto ‘box sending power to all four wheels, and it’ll get from blocking the entrance of a drive-thru to 60 MPH in under 4 seconds. The Stelvio looks to be quite an attractive SUV, with Alfa’s trademark mons pubis-shaped grille up front and an athletic, crouched stance overall that helps avoid the usual overtall, overgrown look of many SUVs. There’s a lot of surface modeling on the sides that I find sort of reminiscent of draped fabric, and that helps break up any large expanses of sheet metal. If you like the 4C, you better hope other people like this Alfa SUV, because the Stelvio is the one that’ll be bankrolling all the little, more fun Alfas in their U.S. adventure. 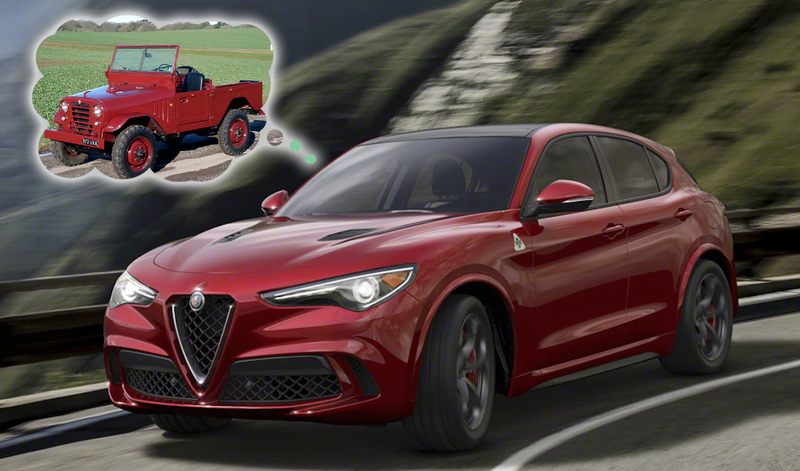 The original Alfa off-roader nickname meant "crazy." True story!